The carmaker is partnering with Walmart and Postmates, using self-driving cars to deliver grocery items. The move highlights the challenges facing Ford as ride-share and tech companies cut into the need for individual car ownership. (NEW YORK) — Ford is getting into the food and diaper business. The carmaker announced a partnership with Walmart and Postmates on Wednesday, that would use self-driving cars to deliver grocery items using Postmates’ infrastructure. The move highlights the challenges facing Ford as ride-share and tech companies cut into the need for individual car ownership, and gives Walmart something to compete with Amazon’s vast logistics operation to deliver consumer items in the traditional retail “last mile” journey home. “We are exploring how self-driving vehicles can deliver many everyday goods such as groceries, diapers, pet food and personal care items. Enabled by Postmates delivery as a service, we were able to quickly set up a pilot program that explores how our self-driving vehicles can complement Walmart’s existing delivery offerings,” Ford Autonomous Vehicles director of business development Brian Wolf wrote in a Medium post. Walmart has been using Postmates to deliver grocery items picked by the retailer’s personal shoppers, which will be available in 800 stores in 100 metro areas in the U.S., Wolf wrote. By next year, the number of stores offering delivery is expected to double. The partnership to use self-driving cars for delivery, ahead of, say, commuting, was a good way for Ford to get into the autonomous game without too much risk, experts said. 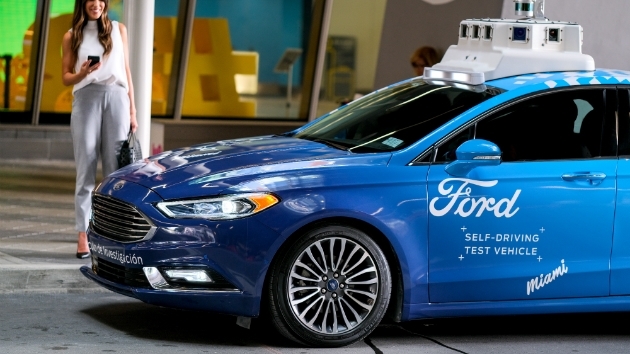 “Doubling down on the commercial side of self-driving technology is a safer bet for Ford, but could be one that pays off well in the end. Solving commercial challenges is far easier than solving commuter ones, and is most likely the area where self-driving technology will take off first,” Jeremy Acevedo, Edmunds manager of industry analysis, said in a statement. “People may not be willing to trust a self-driving car to take them somewhere, but if the car is going to bring things to them and make their lives a little easier, suddenly the technology is a lot less scary,” Acevedo added. The Ford grocery delivery program will launch in Miami, where the company has already completed 1,000 deliveries, Wolf wrote. Ford launched its autonomous driving experiment in the beach city earlier this year, partnering with Domino’s and Postmates. The Domino’s cars have a human driver. “A self-driving vehicle won’t need to be tipped and it won’t park illegally,” Sherif Marakby, Ford’s vice president of autonomous vehicles and electrification, wrote in a Medium post at the time.